Sooo…. 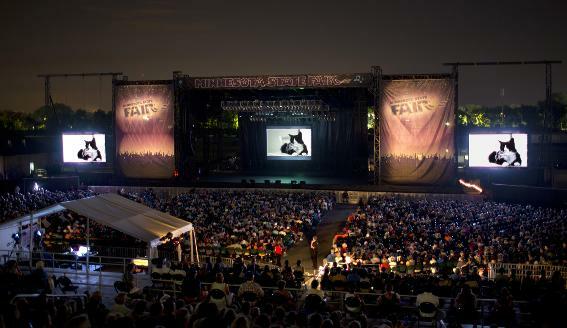 “Cat Vid Fest” or should I say “#catvidfest”… Where do I start. Well, I guess i’ll start by saying I was convinced that I was a cat until about first grade. Luckily my understanding of social ques kicked in before it became psychologically damaging. My first treasured companion was my childhood cat “Meeseball” who was followed by many other awesome feline friends. Now I understand that I was never a cat, but instead cats just turned out to be hairy humans…I had it all backwards. 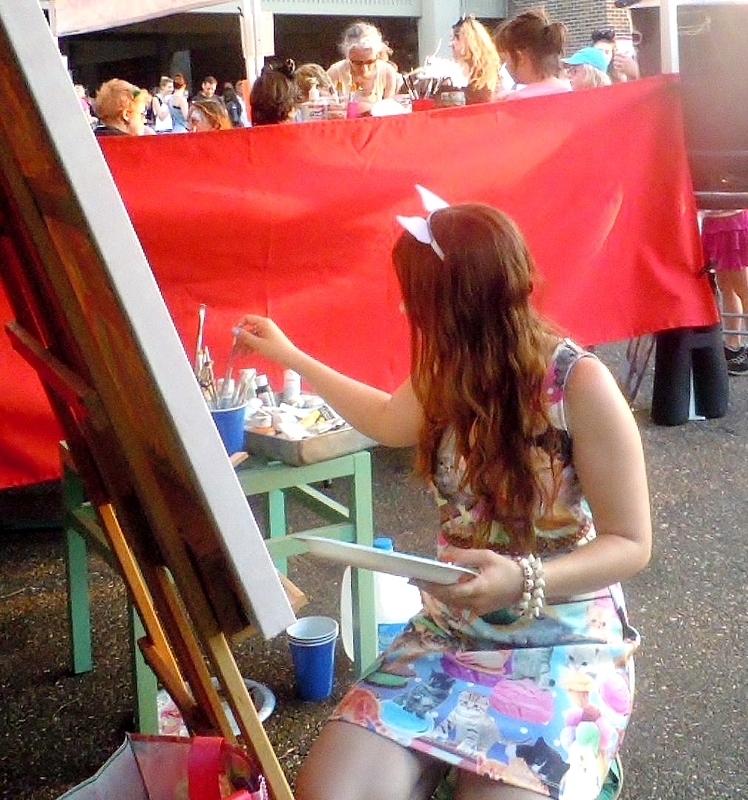 Anywho, CATS, I was extremely lucky to be able to do a live painting at the Walker Art Center’s Cat Video Festival on Wednesday. It was a mega blast of cat fortified fun. Animal Planet sponsored the event, and they streamed it live on their site. You can see the videos that were featured right here. Hasbro provided Gold and Silver cat awards for Cat Vid Fest that were fittingly modeled after the new Monopoly piece which is, naturally, a cat. Peace out iron… I am extremely impressed by all the work that went on behind the scenes to put this crazy event together and the Walker Art Center did a Stellar job making the Cat Vid Fest awesome, entertaining and just plain fun. 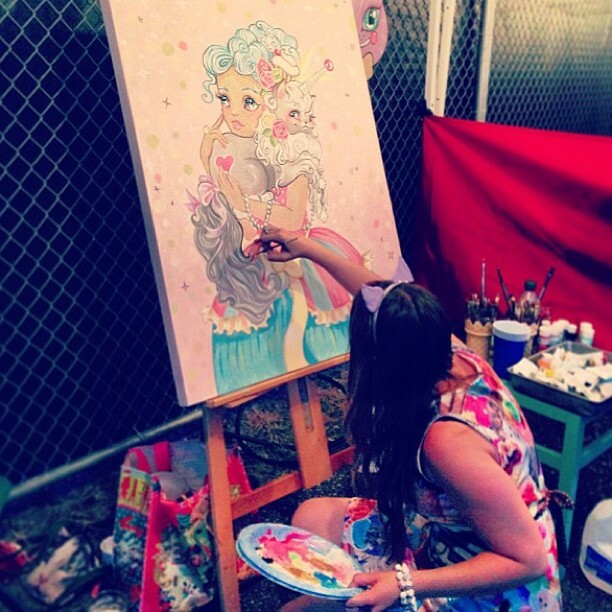 Here’s the painting I finished at the event. It was a HOT day. Hot is an understatement. Of course, that wasn’t too big of an issue because no amount of sweltering heat can keep die hard cat video fans away from a party like this. Around 6:00pm, people started flooding in with gusto. Some people were decked out to the nines in cat gear. I really enjoyed the large demographic of different kinds of people that attended the event. 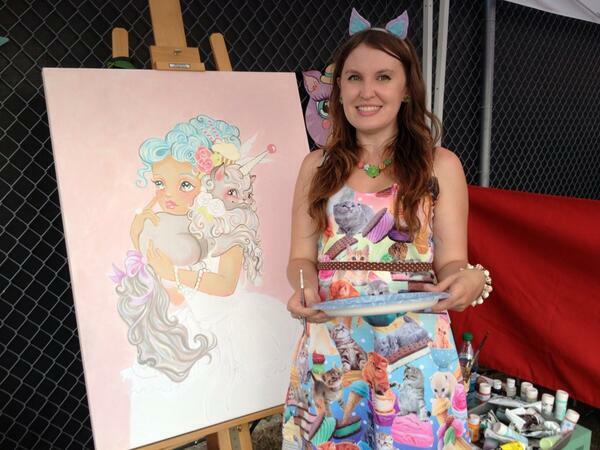 A whole bunch of people stopped by my painting tent to say hi and talk cats and art! (Thank you!!!) It really goes to show that for some magical reason, cat videos seem to bring all sorts of people together, because, whether its public or private you can’t deny watching at least one of these cat videos. Even if you aren’t a cat person, the videos are amusing and fun, only those with hearts of steel won’t crack a smile at the cat in the shark suit riding the roomba… and why is there a duck walking around? And the dog wears a shark suit too? You don’t have to be a mega cat fan to enjoy this event. The concept of Cat Vid Fest is kind of simple and whimsical, but sooo SMART, ingenious really, and of course its exceptionally silly. It is cute and sort of dumb, but in a good way… If that makes sense. It doesn’t seem like Cat Vid Fest is just about cat videos, but more so about the experience of watching the videos with thousands of strangers, meeting other cat people, and waving your freak flag with strangers. Koo Koo Kanga Roo provided a punchy, pun-riddled sound track and the majestic carved Butter Cat (carved by Linda Christensen) was thoroughly enchanting. At the end of the night, I got to meet Lil Bub, which was really cool. She’s a tiny alien babe, sent from space to make you feel happy. Plus, she has an attractive brain-washed dude that carries her around and does her bidding. I’m not going to post the picture of myself with Bub because I look really cracked out after painting all day in the Hot Hot Heat. I will secretly cherish it forever… So instead, here’s my favorite video shared at the event. I feel really blessed to have been able to be part of Cat Vid Fest 2013, it was an awesome experience from the perspective of both an artist and a cat enthusiast, I was really blown away. The overall silliness and happy energy of Cat Vid Fest left me swooning for more, so much that I actually went out for more cats the next day. 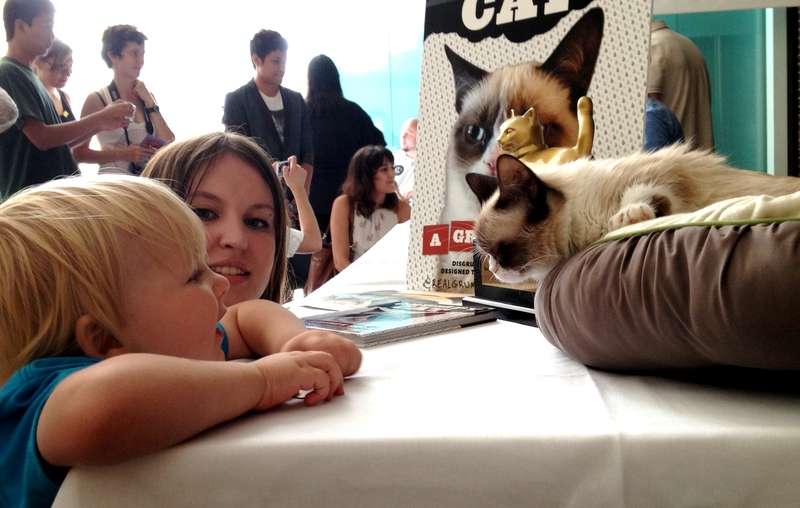 On the 29th, the day after Cat Vid Fest, the creator of Henri, le chat noir (William Braden), Lil Bub, and Grumpy Cat (Aka Tardar Sauce) were signing their books from 2-5pm at the Walker Art Center. I wasn’t planning on going but I spontaneously decided to take Vincent and see if I could have “the cats” autograph some books to him. Got there around 1:30 and were lucky we did because the place filled up fast. If you have ever had to stand in a long line, in a museum, with a two year old, you don’t need me to tell you that its a good thing we got there a little early. I was shocked because by 2, the place was overwhelmingly packed! I haven’t gone to a book signing before, it’s not really my thing to swoon for celebrities (Celebrity Cats are another story, obviously! 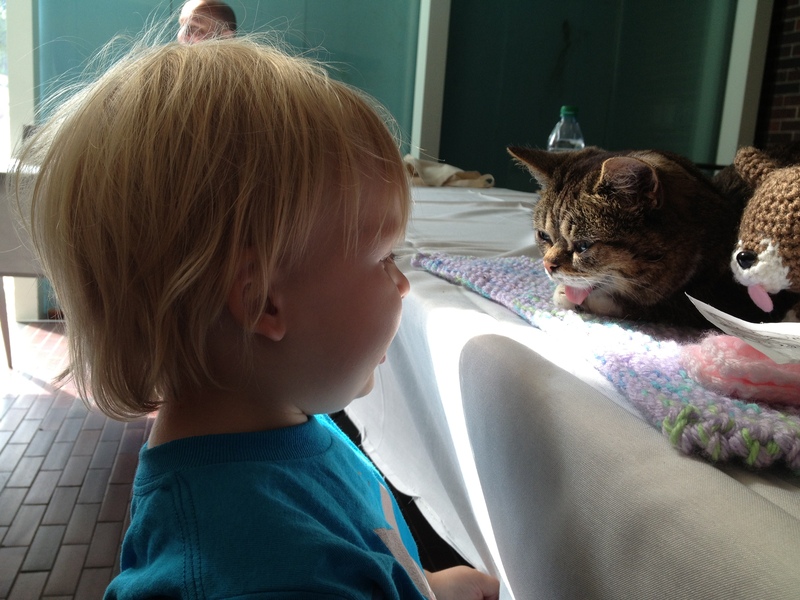 ), but I really wanted Vin to get a little taste of cat… not literally of course… although he did get a good taste of Lil Bub in the form of a kiss. He got to see the “Mow Mows” and got his little books and we was so very excited when Lil Bub reached out a few times and bumped noses with him. The whole ride home we was saying “Mommy Kitty nose kiss” and “Mow Mow kiss Nose” We also checked out the Abraham Cruzvillegas Exhibition which was very interesting and it deserves its own post. It was Vincent’s first real museum exhibition experience outside of the MIA. 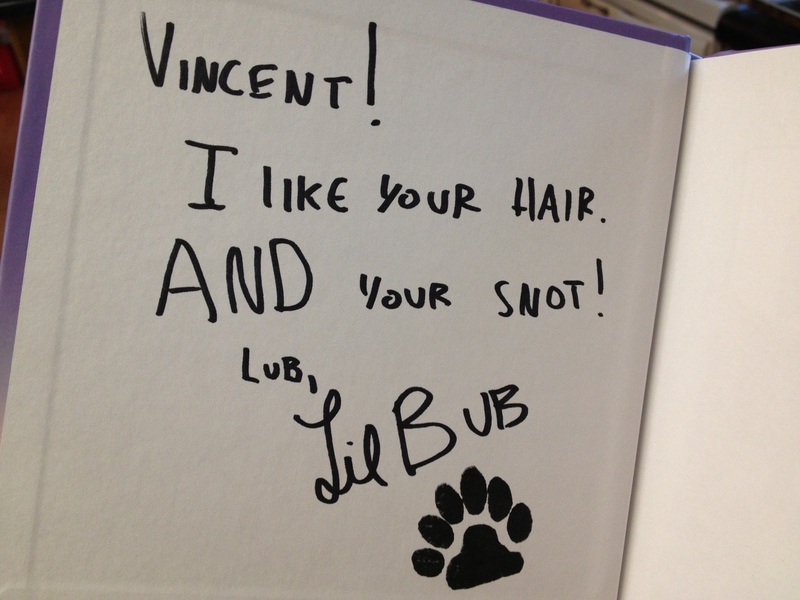 Vin almost got a booger on the Bub…. I hope you don’t think this is the last cat post i’ll be making because Spoke Art is about to have a really awesome Lil Bub themed exhibition opening coming up that will be part of Lil’ Bub’s book tour. The show will be shown along side Casey Weldon’s “Meow Brow” solo show. He’s awesome go check him out! 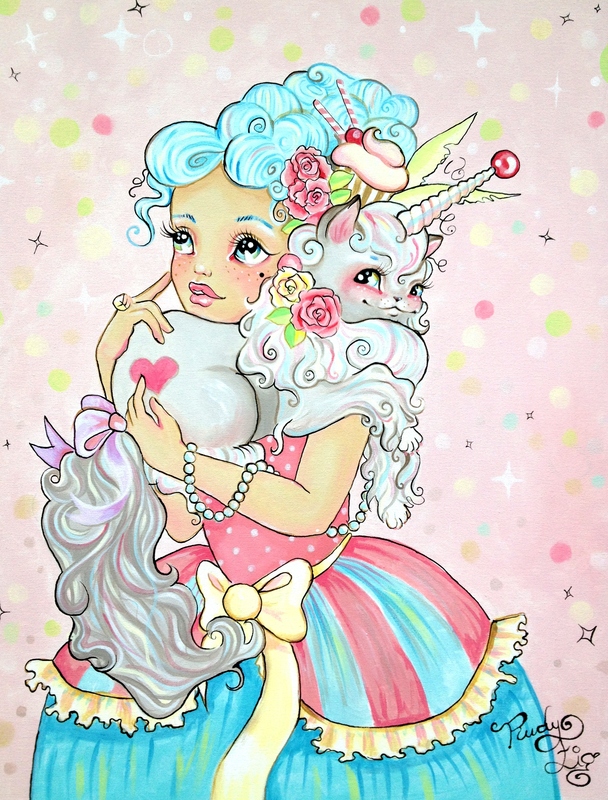 We featured one of his awesome pieces in the Sweet Hot Mess show. 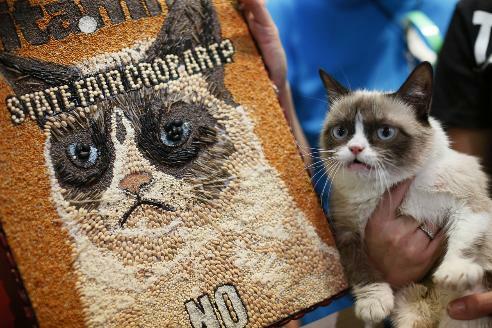 Stay tuned to see my Lil Bub piece for the show very soon!